The timescale for sticking to these precautions should be determined by your doctor. 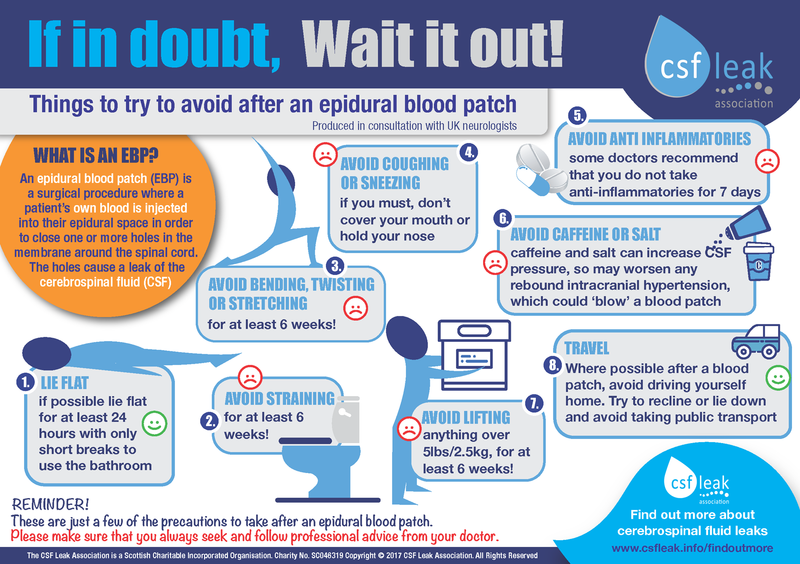 The most common intervention to resolve a spinal CSF leak that hasn’t resolved on its own is an epidural blood patch. Click on the postcard to download a copy suitable for sharing on social media. It is important to note that there are no absolute right or wrongs when it comes to what you should/should not do following a blood patch, nor how long precautions should last. Guidance must always be sought from the doctor(s) responsible for your care. We have prepared a handy postcard-sized guide outlining some of the sensible precautions that may be considered. It has been published in consultation with some of the UK’s top doctors working in the field of CSF leaks, but there may well still be differing views on what is or is not safe to do. 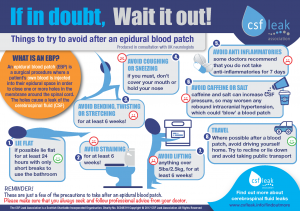 The advice in this postcard may also be relevant for fibrin glue patches as well as those performed using autologous blood. Please click here to download a copy of the postcard suitable for printing. Rebound intracranial hypertension (sometimes called ‘rebound high pressure’ and colloquially shortened to RHP) can be a complication of epidural blood patching or surgery performed to resolve a CSF leak. It is characterised by increased intracranial pressure, resulting in potentially severe headache, nausea, and vomiting. As a condition, it has only relatively recently begun to be recognised by doctors, however there are now a number of good medical papers documenting its existence and discussing ways to manage it. It is still not uncommon, however, for many neurologists and other specialists to be unaware of its existence. You can click here to read a good journal article that outlines key points about rebound intracranial hypertension as they are currently understood, or click here to view our journal library which contains a number of papers on the topic. While there is no magic diet that can cure a CSF leak, good nutrition can help to give the body the best possible chance of healing; this may be particularly the case where a connective tissue disorder, such as the Ehlers-Danlos Syndromes (EDS), has a role to play in a CSF leak. We share below a lecture given by former CSF leak sufferer, Lisa Jamieson, who tells her story of how she learnt to manage her hEDS symptoms using nutrition. Lisa is now working in postgraduate research and hopes to soon start a clinical research study into the benefits of nutrition on EDS. There are no specific physiotherapy guidelines for CSF leak sufferers in the UK at this time. However, as the precautions outlined above demonstrate, there are clearly things that are sensible to avoid or adapt if you are recovering from a CSF leak, be it naturally or following surgical intervention. Laura Freed, a physiotherapist in the USA, gave an excellent presentation on ‘Sensible Physical Restrictions after Epidural Patching or Surgery’ at the 2017 Spontaneous Intracranial Hypotension Symposium in California. We would recommend that all CSF leak sufferers take time to watch it.